FIRST SPECIAL GRADE CASTOR OIL is produced by refining Commercial Grade Castor Oil through bleaching and filtering process. Bleaching is done using Bleaching Earth and Activated Carbon, which helps in reducing colouring pigments or impurities and moisture content. PALE PRESSED GRADE (PPG) CASTOR OIL is characteristically clear and free from suspended matter. This light in colour, low acidity oil is obtained from the first pressing of the Castor Seed. 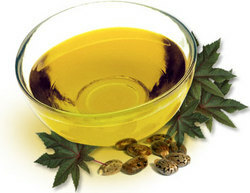 Pale Pressed Castor Oil is used in industrial products that require oil with lighter colour and lower acidity. COLD PRESSED GRADE comes in two varieties- Virgin and Refined. The Virgin Oil is obtained by hydraulic (mechanical) pressing of seeds without applying the heat. Uses include cure of skin problems, burns, sunburns, skin disorders, skin cuts, abrasions and is also used as a laxative. The Oil is also used as a rub or pack for various ailments, including abdominal complaints, headaches, muscle pains, inflammatory conditions, skin eruptions, lesions, and sinusitis. Castor Oil has also been used to draw out sties in the eye by pouring a small amount into the eye and allowing it to circulate inside the eyelid.